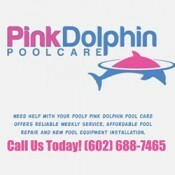 Short Business Description: Pink Dolphin Pool Care is a family owned and operated business serving the people of Phoenix’s Northwest Valley including Glendale, Sun City, and Peoria, AZ. Pink Dolphin Pool Care offers a complementary series of swimming pool services and pool repairs. 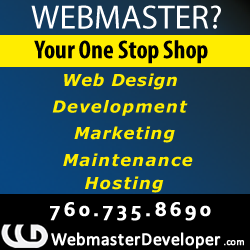 We serve clients throughout the Northwest Valley of Phoenix, Glendale, Peoria, and Sun City, AZ area. Family owned and operated, Pink Dolphin Pool Care is dedicated to providing superior customer service at affordable rate. Whether you need weekly pool cleaning services, pool repair or need an ENERGY STAR® certified variable speed pool pump installed, Pink Dolphin Pool Care can do the job. Find out why other Northwest Valley customers have come to respect and depend upon us for their swimming pool maintenance over the years. 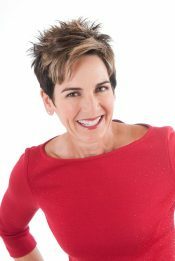 Our AZ Contractors license is #279692. Use the form to the right or give us a call at (602) 688-7465 (That’s 688-PINK) and we’ll be happy to help with all of your pool care needs. Business Address: 6740 W. Deer Valley Rd. 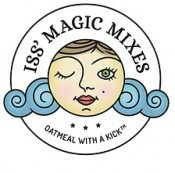 Iss’ Magic Mixes – Oatmeal Cafe serves a primarily vegan breakfast menu with very limited vegetarian options; all of the oatmeal mixes, pancakes and baked goods are completely vegan, diabetic friendly and incredibly delicious. The cafe also serves a variety of vegan smoothies, hot chocolates and artisan locally produced teas. Located on the S/E corner of Dobson & Guadalupe in Mesa, this breakfast/brunch spot is a hidden treasure! P.S. Stay tuned for our light lunch menu of vegan oatmeal burgers, wraps, soups and salads that we will be offering soon! Short Business Description: Gammons Gulch Movie Set and Museum is located right outside of Benson, Arizona and provides tours and serves as production location for film, television, photography and event rental projects. Set back into time when you enter the gates of Gammons Gulch. This unique destination is filled with history and movie memorabilia. The town folks are welcoming and provide tours throughout the town. Belly up to the bar in the saloon and enjoy a cold Sasparilla, visit the miners camp and see how it was done so many years ago. Listen to the stories your tour guide Jay Gammons tells with humor and filled with facts of the history of the area. Thrill to see the movie memorabilia, props and antiques that are displayed everywhere you look. A memorable place to visit. You enter a stranger and leave as family. Visit the web site for more information on tours or how to book this location for your next film, photography, tour or event. Photo courtesy of Gammons Gulch.